Recaptured birds are birds that have previously been banded and are found again. 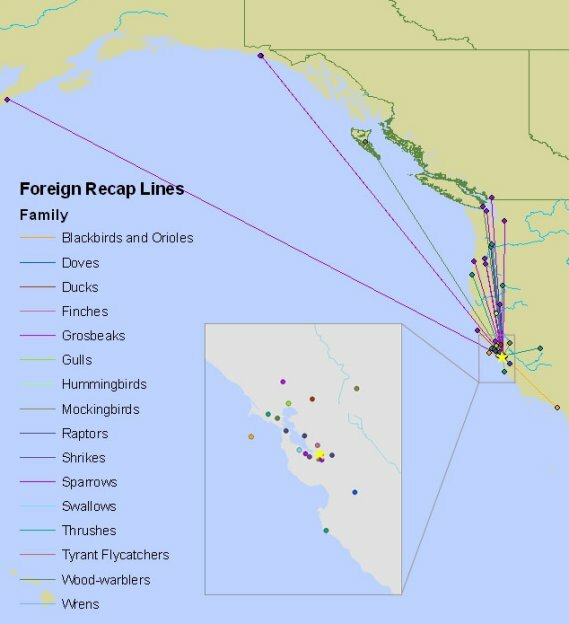 The above map shows birds banded elsewhere and recaptured at the Coyote Creek Field Station (CCFS) or birds banded at CCFS and found elsewhere. Anyone who recaptures or finds a bird with a band can read the number and submit the information to the Bird Banding Laboratory (BBL). The BBL will send a certificate explaining who banded this bird before and where the bird or band was recovered.